COLUMBIA, S.C., Tuesday, Jan. 31, 2017 – During the month of February, join Historic Columbia in honoring Black History Month and learn about important local African American people, places and moments in Columbia and Richland County’s history. Attend a variety programs throughout the month, tour the Mann-Simons Site and the Woodrow Wilson Family Home and become a volunteer at the newly interpreted Mann-Simons Site. Tuesday – Saturday: 10 a.m. and 1 p.m. and Sunday: 1 and 4 p.m. Discover the role race has played in shaping the capital city at the newly interpreted Mann-Simons Site, the home to the same African-American family for nearly 130 years. Tours are free for members, $8 for adults, $5 youth (ages 6-17) and free for children under 5. Tickets can be purchased at the Gift Shop at Robert Mills House, located at 1616 Blanding Street. All tours begin at the Gift Shop. For a more detailed tour schedule, visit historiccolumbia.org. Tuesday – Saturday: 11:30 a.m. – 2:30 p.m. and Sunday: 2:30 p.m. Explore the roles that African Americans played during Reconstruction at South Carolina’s only presidential site, the Woodrow Wilson Family Home. Tours are free for members, $8 for adults, $5 youth (ages 6-17) and free for children under 5. Tickets can be purchased at the Gift Shop at Robert Mills House, located at 1616 Blanding Street. All tours begin at the Gift Shop. For a more detailed tour schedule, visit historiccolumbia.org. 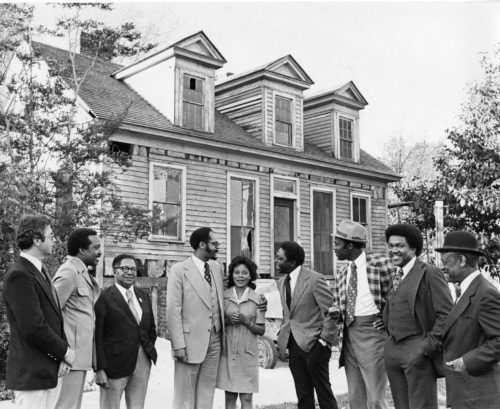 Delve into the history of African American buildings and families of Columbia and Richland Country on Historic Columbia’s African American Heritage Sites and Waverly web-based tours. Web-based tours are free and available at historiccolumbia.org. Black History Month programs are sponsored by McDonald’s® of Columbia, SC, The State Media Company, The Big DM and Hot 103.9/93.9. To learn more, visit HistoricColumbia.org/BlackHistory. Group of preservatists standing in front of the Mann-Simons Cottage.